Bedford is a suburban community of Halifax, Nova Scotia, Canada. It was an independent town from 1980 to 1996. Bedford is on the northwestern end of Bedford Basin, an extension of the Halifax Harbour, which ends just before Nova Scotia Highway 102 and the Bedford Bypass, next to Lower Sackville. Bedford is at the junctions of Trunks 1, 2, and 7. The area of Bedford has evidence of indigenous peoples dating back thousands of years. Petroglyphs are found at Bedford Petroglyphs National Historic Site. The Bedford area is known as Kwipek to the Mi'kmaq First Nation. Father Le Loutre's War began when Edward Cornwallis arrived to establish Halifax with 13 transports on June 21, 1749. By unilaterally establishing Halifax the British were violating earlier treaties with the Mi'kmaq (1726), which were signed after Father Rale's War. The British quickly began to build other settlements. To guard against Mi'kmaq, Acadian and French attacks on the new Protestant settlements, British fortifications were erected in Halifax (1749), Bedford (Fort Sackville) (1749), Dartmouth (1750), Lunenburg (1753) and Lawrencetown (1754). The history of Bedford began when Governor Edward Cornwallis organised his men and began the construction of a road leading to Minas Basin on the Bay of Fundy after establishing the garrison at Halifax. To protect it, he hired John Gorham and his Rangers to erect a fort on the shore of Bedford Basin. It was named Fort Sackville after Lionel Sackville, 1st Duke of Dorset. The area around the fort became known as Sackville until the mid-1850s, when it became Bedford. In 1752, among the first to receive a large land grant was military officer George Scott in the Fort Sackville area. Scott later participated in the Expulsion of the Acadians, specifically the St. John River Campaign (1758). His brother, Joseph, was paymaster at the Halifax Garrison in the 1760s, received two grants in 1759 and 1765. And built Scott Manor House in 1770. The village adopted the name Bedford around 1850. The name is in honour of John Russell, 4th Duke of Bedford, Secretary of State for the colonies in 1749. In 1896, the name became official by an Act of Legislation. A map of the Bedford area of HRM. Bedford was incorporated as a town on July 1, 1980. [contradictory] On April 1, 1996, Bedford was amalgamated with Halifax, Dartmouth, and Halifax County Municipality to form the Halifax Regional Municipality (HRM) for the municipal level of government. The place name still exists, however, for 911, mail, legal, and other services. The mayor of Bedford at the time of amalgamation, Peter J. Kelly, would later serve as mayor of HRM, from 2000 to 2012. The first mayor of Bedford was Francene Cosman. The March 23, 1997 issue of Maclean's magazine rated Bedford as being the "Best Community to Live in Canada." Median household income in 2000 was $64,963. Unemployment rate in 2001 was 6.7. Average house value in 2001 was $179,881. There is a popular walkway along much of the Bedford Basin waterfront that begins at DeWolf park, and continues as the Bedford-Sackville Connector Greenway, a crushed gravel covered trail that meanders along the Sackville River. There is an outdoor 25m pool and smaller splash pool located at the Lions Park on Shore Drive. In the summer there are numerous lakes suitable for swimming. The topography of the area limits the possible locations for soccer and football fields. However, there are fields at Basinview Drive Community School, Sunnyside Elementary (Eaglewood location), Rocky Lake Junior High, Charles P. Allen High School, Bedford South School, and Range Park. The community is currently home to six ice surfaces, at the Lebrun Centre, the Gary Martin Dome and the BMO Centre. Bedford is a well-established sailing community, and is home to the Bedford Basin Yacht Club and Marina. Bedford Days has occurred annually at the end of June and beginning of July for over 30 years. Currently, most events take place at DeWolf Park. There is an Opening Celebration, Rubber Duck Dash, Free pancake breakfast, Dog show, Scott Manor House Tea Party, Kids' Extravaganza, Kids' Triathlon, Movies in the Park, and a Canada Day Celebration. The Light Up Bedford Parade is an annual parade that runs along the Bedford Highway from Bedford Place Mall and ends at DeWolf Park. At the park there is a hot chocolate stand, Christmas carol singing, contests, and prizes. At the conclusion of the parade, a Christmas Tree is lit. In addition to bringing the community together to celebrate the beginning of the Christmas season, the parade serves as a fundraiser for the Turkey Club Society, which raises funds to ensure all residents of HRM are able to provide a Christmas dinner for their families. The parade takes place on the Sunday following the Light Up Halifax Parade, which is usually mid-November. Bedford is served by Halifax's transit authority, Halifax Transit. Routes 66, 80, 81, 82, 86, 89, and 90 directly serve Bedford while many more routes serve the nearby Cobequid terminal in Lower Sackville. Francene Cosman - First Mayor of Bedford, former MLA and cabinet minister, former President of the NS Status of Women. Harry DeWolf - first captain of HMCS Haida (G63). Ante Jazic - Soccer player for MLS team Chivas USA. Shawn MacKenzie - Professional hockey player. Geoff Regan - Member of Parliament for Halifax West, which includes Bedford and the 36th Speaker of the Canadian House of Commons. Kelly Regan - Member of the Nova Scotia House of Assembly for Bedford-Birch Cove, which includes Bedford. ^ "Nova Scotia Community Counts". Province of Nova Scotia. Retrieved 2011-09-02. ^ "Nova Scotia Community Counts web page - data modeled from Statistics Canada, National Household Survey, 2011". ^ "Bedford Petroglyphs National Historic Site of Canada". HistoricPlaces.ca. Retrieved September 23, 2018. ^ "Welcome to Mi'kma'ki". thecoast.ca. Retrieved September 23, 2018. Grenier, John. The Far Reaches of Empire. War in Nova Scotia, 1710-1760. Norman: U of Oklahoma P, 2008. Wicken, William C. (2002). Mi'kmaq Treaties on Trial: History, Land and Donald Marshall Junior. University of Toronto Press. ISBN 978-0-8020-7665-6. 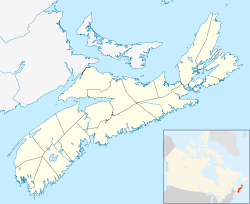 Wikimedia Commons has media related to Bedford, Nova Scotia. Wikivoyage has a travel guide for Bedford (Nova Scotia).